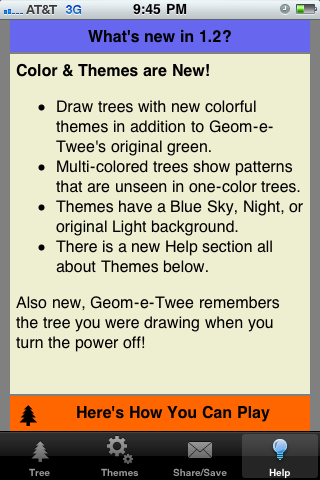 Geom-e-Twee turns an iPhone or iPod Touch into a portable fascination for children. 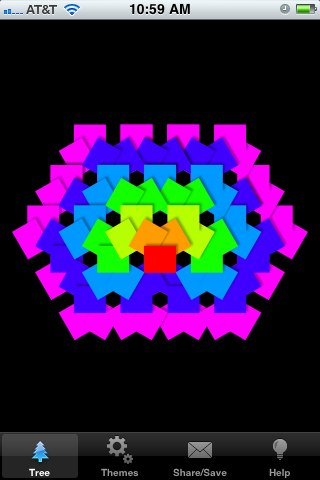 Tree is the active surface. Multi-touch gestures vary the tree's form. Move one finger up or down on the display to change the angle between branches. Tap several fingers at once to change the number of branches the nodes throughout the tree. Pinch or spread with two fingers to change the common ratio of all branches to their stems. 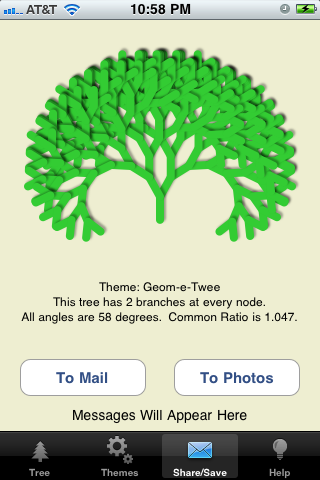 Double tap to have geom-e-tree use a special common ratio - branch tips will just touch each other but not overlap. Tap in upper or lower half of display to adjust the angle by +/- one degree. Choose any of these colorful (or bold) themes to play with. 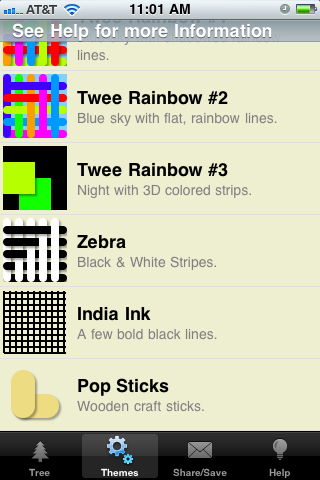 More themes will be added as Twee gets a little older! When a particular twee strikes your fancy, go to the Share/Save tab to preserve it. To Mail: If your device is configured for Mail, Geom-e-Twee can attach a twee to a message for you to send. To Photos: You can save a twee in Photos, and then handle it like any other photo. Here is a link to the built-in Help Page for your reference.